Writer Gavin L. McAllister was kind of enough to participate in this “Micro-Author Interview” series. 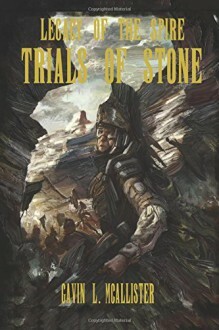 Gavin is the author of the science fiction/fantasy epic “Trials of Stone” (Legacy of the Spire # 1), a novel that explores political, military, and religious themes in a society in turmoil. Q: What does being an indie author mean to you? I think being an indie author means having the freedom to create without restriction or inhibition. I believe in art for the sake of art so I enjoy the fact that I can write and paint without depending on it to earn a living. This gives me the ability to express, convey and immortalize my experiences and ideals in a meaningful way through my prose. If only one person in the world reads my work, I feel that I’ve accomplished my purpose for producing art. Q: What’s your favorite sentence or paragraph from one of your books? What does it mean to you? Just as the man said, the hall soon ended with a small side room to the left and a deep stairwell directly ahead that descended into what seemed to be a pool of thick, murky darkness. At this point she was required to remove her cloak and shoes. They had to be placed into one of many small apertures that had been carved into the wheat-colored metastone wall. From her current vantage point, she thought it resembled a large piece of honeycomb. She placed her belongings inside an empty compartment and proceeded out of the room, following the man down into the shadows. There was no lighting on the way down, and the man motioned for her to take the railing that had been installed on the right and left walls. As they made their descent, her eyes adjusted to the gloom, and she couldn’t help but notice how worn and smooth the steps were underfoot. She surmised that they had seen regular and heavy traffic since their construction. She didn’t understand why, but she felt comforted every time her foot pressed against each step: almost as if she could always depend on it, and that it would never be anything but stone. It would always support her weight, and it would never give way or collapse. Those were pleasant thoughts, and she was surprised that she had never drawn those associations before. She had lived her entire life surrounded by stone, yet up to this point had never seen possibilities in the abstract. I really like this paragraph from my novel because it demonstrates the ideals of an entire society through one character. The Pirassi are heavily entrenched in their own customs and traditions. They take great pride in their culture and seek to propagate and perpetuate it at any cost. The symbolism here is comparing the strength and solidarity of the Pirassi people in regards to their culture to that of stone. Stone is hard, durable and has many uses, however, its weakness is that it has no flexibility. The Pirassi people suffer from the same weakness in that they are unable to culturally adapt to changing times which is a major underlying conflict across the course of not only the novel, but the series as a whole. Q: What advice would you give other indie authors starting out? The best advice I can give other indie authors who are just now getting their feet wet can be summarized in one word: perseverance. Writing a novel was one of the most difficult projects that I’ve ever undertaken. It requires a great deal of time, energy, and unlimited patience. Ideas and creativity can’t be turned on and off with the flip of a switch unfortunately. I would advise carrying around a small notebook or ledger. I would find that ideas came to me in the most unlikely of places at varying times of the day. I even kept my ledger on my bedside table because I would wake up in the middle of the night and find myself scribbling down an idea from a dream. Organization is paramount. Once you’ve collected your ideas, be sure to have a process to your writing. Build an outline and organize your ideas before you start working on a draft. Don’t lose yourself in the never ending cycle of editing. Your work will never be finished and it will never be good enough. You just have to find a point where you are content with the final product and let go. The final piece of advice that I have is to never get discouraged. Some days my creativity just dried up and I felt like I was wandering through the desert for what seemed like ages. Your ebb and flow of ideas has its own rhythm; don’t force it. Manage your expectations and always keep your reasons for writing at the forefront of your mind. Q: What’s children’s cartoon best represents your personality? If I could choose a cartoon that best represents my personality, I’d have to go with Brain from the show “Pinky and the Brain.” I’m a planner by nature (although I’d hardly consider my plans to be diabolical) and I have an incredible amount of determination when it comes to something that I want to see come to fruition. Q: What else do you love to do besides write and read? Aside from writing and reading, I really enjoy spending time outdoors. I love to camp, kayak, spelunk, climb, hike, fish, swim, wakeboard, and tube. Q: Has a particular setting, landscape, or cityscape influenced you? I’m happy to say that my writing (the characters and the world they inhabit) find their origin in all of the people and places I’ve seen and met in my young adult life. As a committed expatriate, I’ve visited thirty-eight different countries in my thirty-three years of walking this Earth and it has made a tremendous impact on my ability to create art. I honestly believe that experience is the currency of life and a truly wealthy man dies not with an abundance of things but an abundance of wisdom.